In today's February 1, 2010 newsletter . . . I wish I could thank each of you personally for the many get-well messages that I received during January. They were uplifting and greatly appreciated. Thank you for your kindness. To recap, I took ill on Christmas Day and a few days later I was in the hospital emergency room, diagnosed with pneumonia, and admitted into the hospital. I cannot praise the doctors, nurses and staff enough. They were wonderful, every one of them. When released, I was reminded that I had been very sick and should figure it would take at least a month before I would feel normal again. At home, I cannot imagine how I would have gotten along without the help and support of my wife and family. For a time, my body was bloated and when I looked at my feet my toes looked like mini-sausages. Sick as I was, I actually gained weight. Then as the fluid left, my weight dropped back to normal. But from sleeping most of the time and lack of movement my muscles atrophied. I was miserable enough not to care. For me, that is really saying something. Gradually, my energy started to return and my thoughts turned to getting myself back in shape. I was warned, however, not to push things. And I don’t plan to. 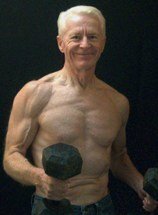 So my game plan is to take a similar approach that I give to beginners in Gray Iron: A Fitness Guide for Senior Men and Women. I will start with short, slow walks, gradually adding to their length and intensity. Fortunately, I live next to trails that pass through wonderful open space preserves. Hiking here is one of the great pleasures in my life. To rebuild muscle, I will begin with single sets of dumbbell and resistance band exercises. I’m in no hurry. But once I’ve established a decent fitness base, I’ll return to the gym where Patty and I have worked out for years. For quite a while I had no appetite to speak of. But when I started enjoying food again, I was pretty good about continuing a normally healthful diet — but with the addition of an ice cream habit. I probably ate more ice cream in two weeks than I would normally eat in two years! Of course that had to stop. When I was feeling really awful and, frankly, at times wondering if I was going to recover, I began to think about some of the unfinished business in life that we all experience. My thoughts also turned something I had written recently under the banner of “Financial Fitness.” It is titled, simply, “Wills and Trusts.” When you are very sick, you think about those things. I hope everyone will read it. I promise it is worthwhile. Again, thank you for your kind thoughts and prayers. They meant a lot. Dive Bombers are a great all around upper-body strength and muscle builders. They are not for beginners though. But if you are in shape and have mastered standard push-ups, you may want to add Dive Bombers to some of your workouts. Watch the short Dive Bomber demonstration here. Like newspapers, magazines and television, the newsletter and web site contain advertising and some affiliate marketing links. I receive a commission when people buy their advertised products or services. The newsletter and web site provide information to help users establish and maintain a fitness lifestyle. But fitness information is not the same as fitness advice, which is the application of exercise and dietary practices to an individual's specific circumstances. Therefore, we always recommend consulting with your physician for professional assurance that information, and your interpretation of it, is appropriate to your particular situation. Your comments or questions are always appreciated.